Along with the need for a projected $650,000 subsidy from the City of Sarasota’s General Fund in the 2019 fiscal year, the Bobby Jones Golf Club has a number of financial issues that recently popped up, club Manager Sue Martin has told the City Commission. The air conditioning system had quit functioning in half of the clubhouse, she reported. At least the system is still operating in the area with the offices, she pointed out. “It’s 47 years old,” she said of the equipment. After having representatives of three different companies take a look at the situation, Martin continued, she was able to provide a “rough estimate” of $60,000 for the repairs. The expense is not the only problem, she pointed out. “We cannot replace the unit where it’s located,” she explained. When the clubhouse was constructed, she noted, it was built around the air-conditioning equipment. “We just keep getting more surprises,” she said. Additionally, Martin told the board, four leaks in the roof are being repaired. The 13 inches of rain that fell in May, she indicated, exacerbated the roof’s deterioration. Finally, Landscapes Unlimited, which had signed an agreement to operate the restaurant, is “pulling out,” she said. The contract included a 90-day opt-out clause, which the company is exercising, she explained. The firm was not making the profit that it had anticipated, she added. That loss will eliminate $5,000 in revenue that had been built into her budget for the rest of the year, Martin noted. Moreover, she told the commissioners, the company was paying a portion of the utilities and solid waste expenses for the club, which means yet more unexpected costs for her budget to absorb through the rest of this fiscal year, which will end on Sept. 30. On a more positive note, she reported that the four workshops conducted — at the City Commission’s request — to assess public interest in the future of the golf club were held at three different locations in an effort to entice members of the public who are not golfers to provide their perspectives. During a May 31 special meeting, the City Commission heard an update from Martin and Richard Mandell of Pinehurst, N.C., the golf course consultant the city hired to assess the plethora of problems at Bobby Jones Golf Club and address how to bring the facilities back up to high standards. Mandell that night presented a revised update entailing about $17 million in repairs and new construction to make all 45 holes enticing once again. Of the approximately 88 people who attended the workshops, Martin said on June 27, 39 were golfers. The sessions were held at the Payne Park Auditorium, the Robert L. Taylor Community Complex and City Hall. No commissioner offered a comment on that. In the meantime, Martin said, research had ensued on temporary fixes to make the golf courses more playable. First, she noted, a landscape maintenance group would be willing to undertake two demonstration projects that would cost about $30,000. Those, she added, would address “two of the worst holes” in terms of drainage. Those are No. 9 on the American Course and No. 16 on the British Course. The firm also had priced out work to correct the more significant drainage issues over all the holes, Martin continued. That estimate is about $300,000. She recommended that the City Commission consider the $30,000 project first, to see how that would work. “This is a temporary fix,” she stressed, but it probably would add three years of life to the courses. As Martin and Mandell have explained to the commissioners, the deterioration of the courses over the past several years has reduced public interest in playing at the Bobby Jones Golf Club. 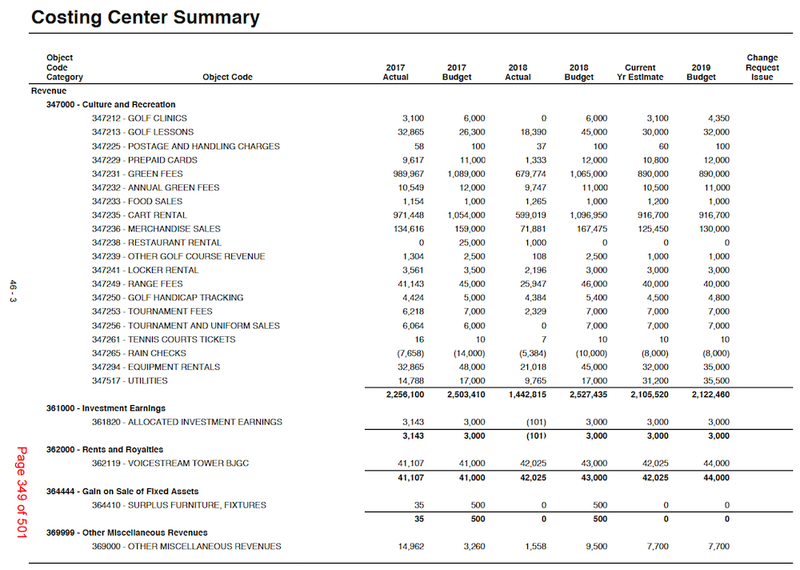 As a result of the facility’s problems and the drawdown of the club’s reserve fund as a result of the Great Recession, the current city budget includes a $425,000 subsidy to the facility. The proposed 2019 fiscal year budget lists a projected subsidy of $650,000, Kelly Strickland, the city’s director of financial administration, pointed out to the commission during its June 27 budget workshop. 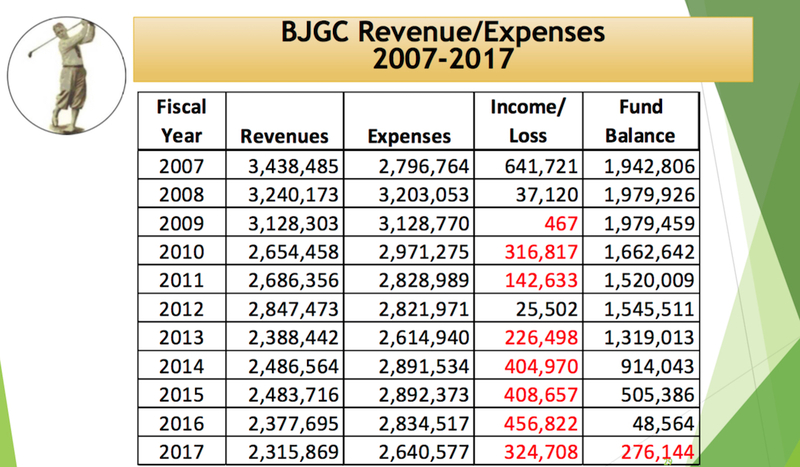 Anticipated revenues for the club for the next fiscal year — which will begin on Oct. 1 — are $2,178,960, with expenditures expected to be $2,826,821. Commissioners explained at various times during their June 26 and June 27 budget workshops that they legally were unable to take any action because of regulations governing workshops. They indicated that they would address questions and concerns during a special meeting that was scheduled for 3 p.m. on June 27. However, during that special meeting, none of them offered guidance to staff regarding consultant Mandell’s next appearance before them. They did engage in discussion about the air-conditioning breakdown at the golf club. Mayor Liz Alpert asked City Manager Tom Barwin about the best approach to such surprises. He replied that the city’s reserves are what staff has to turn to, generally. Under city policy, the unassigned fund balance in the General Fund “for emergency and/or liquidity purposes,” as a staff slide put it, must have enough money to cover two to three months of expenditures. The total must represent from 17% to 25% of the amount in the General Fund, Strickland noted during the budget workshops. In response to Alpert’s question, Strickland pointed out that staff would comb the Capital Improvement Program funds to determine whether extra money could be found in the construction budget for a project planned for the current fiscal year. Then Assistant City Manager John Lege — the city’s previous finance director — noted that, given the fact that the city was approaching the start of its final quarter of the fiscal year, staff also would review the regular General Fund budget to determine whether money might be available. For example, he said, money might have been tied to a position that had not been filled, so it could be used for the emergency project. Brody has voiced opposition to the city’s making a large investment in revitalizing the Bobby Jones Golf Club, having indicated his belief that interest in golf is on the downswing. Nonetheless, Barwin explained that unexpected situations arise each year that demand immediate attention. Noting club Manager Martin’s comments earlier that day, Barwin added that it sounded as though a whole new air conditioning system might be warranted for the clubhouse. Even if the potential still exists for construction of a new clubhouse, he said, that building probably would not be completed for two or three years. Then Barwin pointed out that 1 mill of the city’s millage rate would bring in more than $10 million for the 2019 fiscal year. 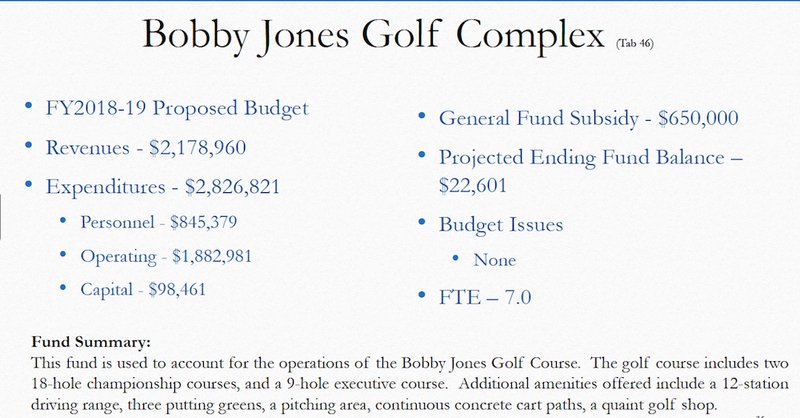 If the commission wanted to invest in the full array of improvements recommended at Bobby Jones Golf Club, he continued, it could raise the millage rate by one-tenth and dedicate the revenue to that project. Commissioner Willie Shaw referenced Martin’s remarks about the clubhouse having been built around the air-conditioning unit, which makes the situation more problematic.